July was such a fun filled month in our household. I’ll have to do a whole separate post to share some of the personal highlights, but right now I thought I’d share what the shop at Sweet Clover Barn looked like for the July sale and what’s still available. This month’s shop was all about the beach with a classic twist! Think Hampton’s Farmhouse – I don’t know if that’s a real thing, but that’s the only way I can think to describe this month’s look. 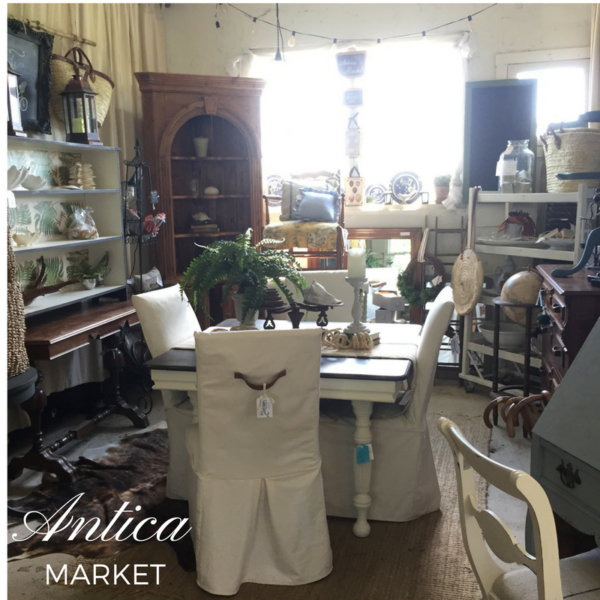 Center stage was this cute vintage table and parson chairs. The table was my husband’s grandmother’s. I painted the base in Old White Chalk Paint and stained the top in General Mill’s Java Gel Stain. This piece is still available for $225. The slip covered parson chairs with leather handles got a lot of attention this month and they did sell! I had several people asking if I would do custom slip covers and I would be happy to, as long as I can have the chair at my home to work on. I use the chair I’m working on to make the pattern. If you live in the area and that’s something you are interested in let me know. That being said, I don’t think I’ll have time for too many custom jobs, so we will have to see how it works out. One of the new pieces I brought to the barn this month was a small hutch. I don’t know if that is the right name for it, but we’ll just say that’s what it is. 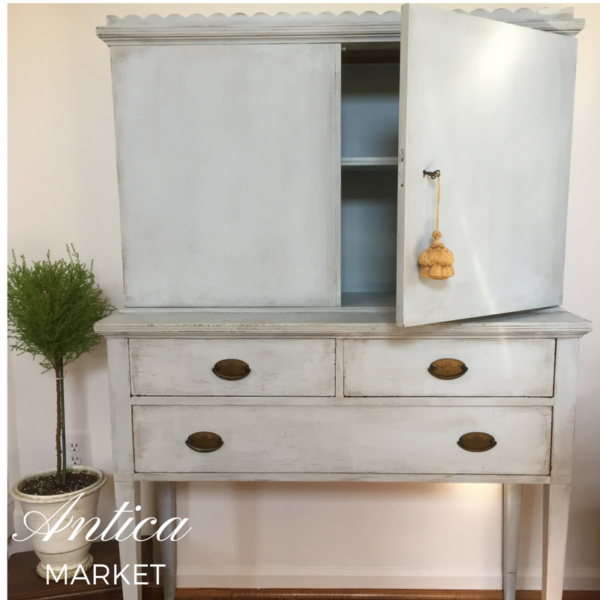 When I spotted this piece I fell in love with the scalloped top trim and knew I wanted to paint it. It was in great condition but I didn’t like the color of the wood or how the finish had aged. My inspiration came from a Ralph Lauren piece. Click here if you’d to see that inspiration piece on Pinterest. I painted it with a couple coats of Amy Howard French Blue One Step Paint, then dry brushed some Selznick Grey near the edges, followed by a coat of Miss Mustard Seed’s Lavender Scented Wax (my favorite). All the hardware is original and the top cabinet locks and opens with the original skeleton key! This piece didn’t sell at this weekend’s sale so let me know if you are interested. Priced at $389. 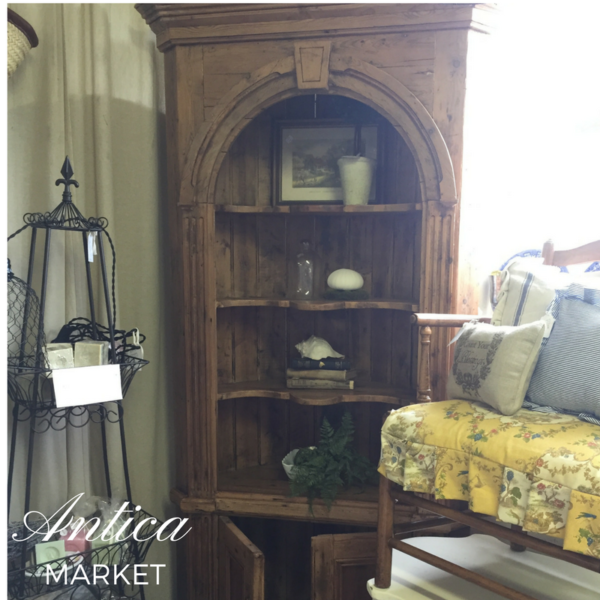 Another new piece I brought up is this rustic pine barrel back corner cabinet. I love everything about this piece! It is available for $450. I almost took this sweet little secretary home because I didn’t think it would fit and it had hung around for a few months, but my friend Lauren of Garner House said I could make it work so I took her advice and I’m glad I did. It sold early in the sale and when I was working on Sunday someone else asked about it. Really makes me ponder – why is it that when a piece sells it seems to become a magnet for other buyers? I know it doesn’t really, but it sure seems that way. Oh – by the way, the grainsack chair is available for $55. 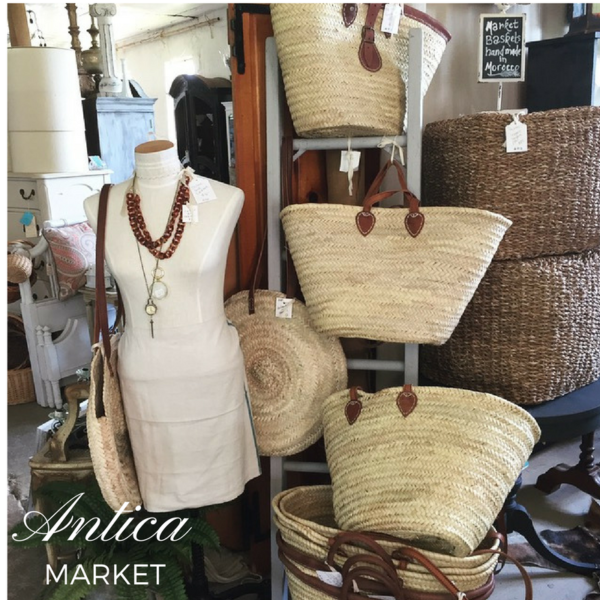 The French market totes are great for using at the market, beach, pool. They are handmade in Morocco. I still have several sizes available and am willing to ship them just let me know if you are interested – they range in price from $38 for the round, $48 leather handle no trim, $55 – $65 for double handle, leather trim and leather clasp. 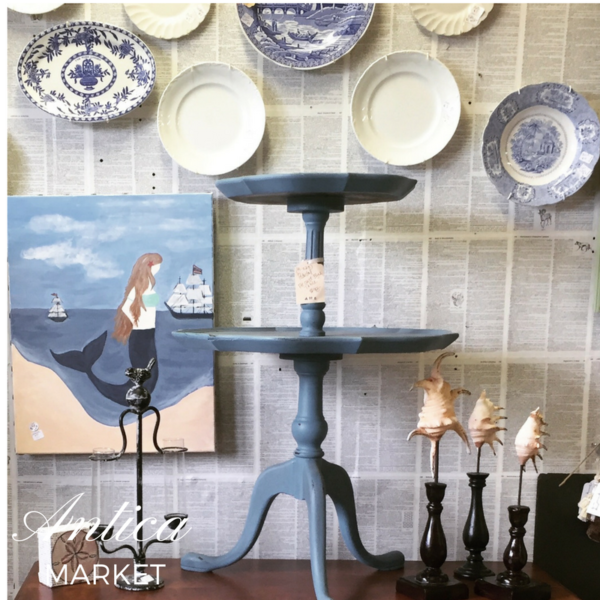 This little blue pie crust table I is available for $78 and some of the plates and ironstone I will be listing soon in the online shop. If you are local I hope you can join us next month. 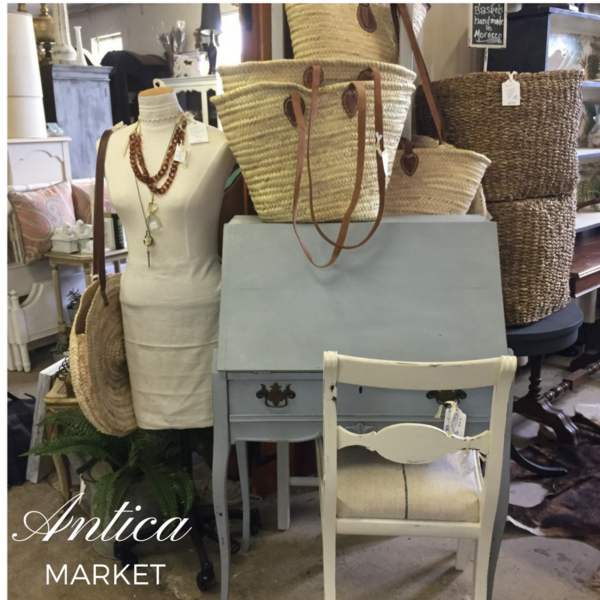 We will be having our Back to School Event and Tag Sale at Sweet Clover Barn August 18-20. Thanks for stopping by. I wanted to develop a quick comment to be able to express gratitude to you for some of the wonderful items you are posting on this site. My extensive internet research has at the end been rewarded with sensible content to exchange with my partners. I would state that that many of us site visitors are unequivocally fortunate to dwell in a remarkable website with very many wonderful people with good hints. I feel rather lucky to have seen your site and look forward to tons of more awesome minutes reading here. Thanks a lot again for a lot of things.